Both the chocolate cake batter and the frosting have an essence of coffee which adds an element of complexity. Eggs and buttermilk make this cake moist and rich. The frosting for this decadent cake included an experimental element inspired by the fact that we’d run out of powdered sugar. Based on Internet research, I found that powdered sugar could be created by putting granulated sugar and a little cornstarch in a blender for 15 minutes. We employ an immersion blender with a nut grinder attachment for these kinds of jobs. After about seven minutes, I decided the sugar looked powdered. The flavor of the frosting was spot on, but the slight graininess proved otherwise. Next time, I’ll muscle through the whole 15 minutes – or ship up enough powdered sugar to last the whole season in the bush. Line two 9-inch springform pans with parchment paper. Butter and flour pans. Set aside. Sift flour, sugar, cocoa powder, baking soda, baking powder and salt into mixing bowl of a stand mixer fitted with a paddle attachment. In a second bowl, mix together buttermilk, oil, eggs, vanilla and coffee extract. With mixer on low speed, slowly pour wet ingredients in with dry. Pour batter into two pans, evenly divided. Cool cakes in pans for 30 minutes. Finish cooling completely on wire racks. Place one cake, flat side up, on a cake pedestal or flat plate. Spread top of cake with frosting. Place second cake, flat side down, on first frosted cake. Spread remaining frosting evenly on top and sides of cake. Melt chocolate chips in a double boiler. Stir until smooth. Set aside to cool. Cream the butter in the bowl of a stand mixer with a paddle attachment, about 3 minutes. Add egg yolk and vanilla. Continue beating for about 3 minutes. Turn the mixer to low and gradually stir in confectioner’s sugar. Add coffee extract and mix until smooth. Wow. 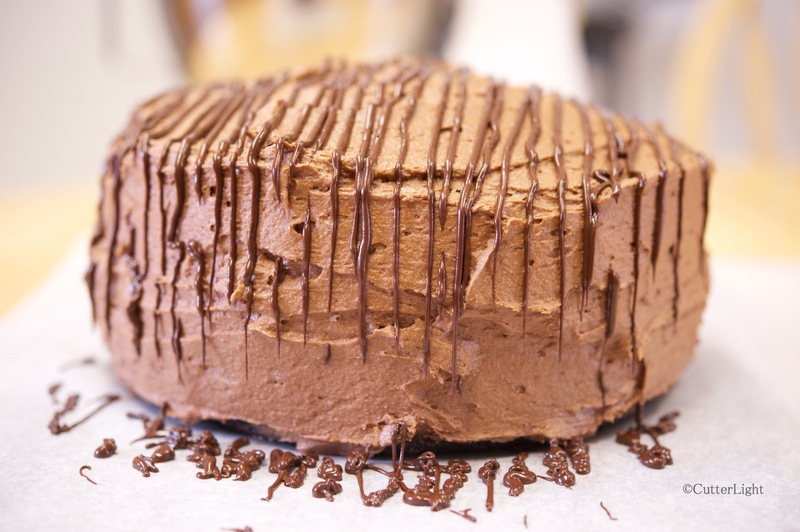 That looks like the ultimate mocha cake. Very yummy! Thank you for sharing the half of the cake with us! Yumm-o! Wow, this looks really good…. My mouth is watering! The cake sounds yummy! I’ve always wondered how the homemade powdered sugar turned out. Great looking cake, delish! I vaguely remember attempting to make powdered sugar, without internet help. I don’t think I was hugely successful! Delightful, decadent, delicious, and guaranteed to nurture the inner man/woman inside every chocaholic. I think with a few more minutes, the powdered sugar would have been fine. I love that you make so many different things with a limited pantry. It is inspiring. I wish I was more versatile in that aspect. Thanks Anna. We talk about this all the time… One of the wonderful things about this chapter in our life is that we have abundant free time to experiment, practice and learn. It’s like being in our own self-study cooking school! That’s such a cool idea. I bet you have had so many experiences because of this unique life you have chosen. It is such a blessing to have a rich life.